Teaching and mentoring, how do I practice it? 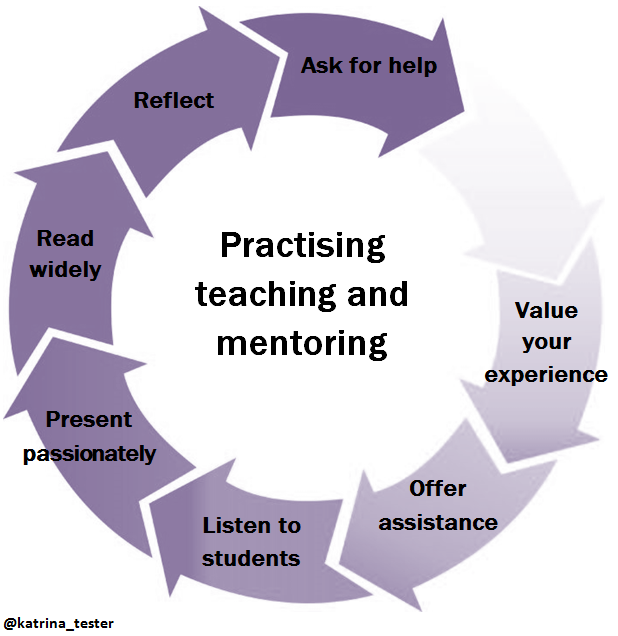 Because 140 characters is definitely not enough for me to answer that question helpfully, here are some of my thoughts on how you can practice teaching and mentoring. The beginning of a journey towards teaching and mentoring is in realising that you have something to offer to others. Learn to find value in your experiences. Recognise that you may provide insight and guidance by sharing your experiences with others. I believe that every tester has something to contribute in a teaching and coaching capacity. Even if you are the most junior member of your team at work, you may still find that you still know one particular test technique or approach better than your colleagues. Or perhaps you've had an experience within your team that could be shared with a wider audience in your organisation? You know your own work better than anyone. Start looking to share your ideas. This may seem obvious, but I am consistently surprised by how few people who want to develop their teaching or mentoring start by offering their help to others. If you want to develop a new skill, then it is important to create the opportunity for you to practice it. I think the safest place to begin is within your organisation. Offer one-on-one assistance to your team mates. Offer to present a lunchtime brown bag session. Offer to deliver a short training workshop on a specific topic or technique. Put up your hand to start developing your teaching and mentoring skills in small steps among the people you know. If you don't feel confident in sharing ideas within your organisation, then perhaps you will enjoy the relative anonymity of looking further afield. You could develop professional relationships through attending your local testing events or MeetUps, which may lead to mentoring and presenting opportunities. Twitter is also a great way to make an open offer, you may discover people with questions that you can answer. As you grow, continue to offer your voice to wider audiences. Challenge yourself to challenge others. When establishing a teaching or mentoring relationship, I think it is important to listen first. Without this step, the people that you are trying to engage may instead feel disengaged, steamrolled and ignored. It is easy to arrive at a coaching session or training course filled with expectations and assumptions. As the facilitator of learning you will have plans for what you anticipate people will ask, and what you want to show them. Don't work from these assumptions alone. It's important to give students an opportunity to feel part of shaping their own outcomes. In a classroom environment, this can be achieved by asking the students for their input to help shape the structure and agenda for the session. In a more informal mentoring situation, I try to let the mentee direct the first half of the conversation. I want to have developed a clear understanding of their situation, problems and needs before I start to suggest options or discuss solutions. Good teachers and mentors don't just communicate their content. They also inspire and motivate their students. Being able to present your message with confidence and passion will help your audience to engage emotionally. Learn basic presentation techniques like pitch, pace, pauses, body language and gestures. Joining an organisation like Toastmasters will help you as a teacher and mentor. A poor presenter can detract from the ideas that they are trying to convey. I believe that good teachers and mentors know a little about a lot of things. If I am asked a question outside of my area of expertise, I am usually able to direct the student towards a group of people or a set of articles that will help them to discover their own answers. This is only possible because I read widely and take an interest in developments happening across the testing discipline, within other roles in software development and more generally in the evolution of technology. The more you expose yourself to new ideas, the better equipped you are to handle unexpected learner-driven deviations from your material. Having the ability to intelligently field impromptu questions will also help to create confidence in the relationship between you and your student. I like to encourage reflection from my students at the end of our sessions, whether in a teaching or mentoring scenario. Providing an opportunity for people to articulate their personal learning outcomes or key takeaways will help reinforce those messages. These reflections also offer valuable insight into whether I have clearly communicated what I intended to. I also see reflection as a key step in evolving as a practitioner. Continually step back from what you have done and assess how you went about doing it. Self assessment is an opportunity to recognise strengths, identify your weaknesses, and brainstorm opportunities for improvement. Did I have a strong opening and listen to input from others? Did the audience find value in my experience? Could I have handled a question or suggestion differently? Do I need to do further research so that I can better respond to future questions? Could I offer to present this again? Would I propose a different structure or focus next time? How did I perform as a presenter? Remember that teaching and mentoring are iterative not immediate skills. Successful teachers and mentors are still learners themselves. If you observe attributes in others that you wish to emulate, then ask them to help you develop. They will probably embrace the opportunity to discuss their practices. I think it's a good idea to start by asking someone within your organisation or local community for their assistance, as they are likely to have a better understanding of your culture, organisation and personal strengths. If there isn't someone suitable nearby, there are a number of mentoring programmes and people within the international community who can provide support. Work collaboratively and ask questions to identify the strategies that will help shape your unique teaching style while achieving good outcomes for your students.